Do you have paths in your garden? Do you have certain routes that you always take when going from one part of the yard to another? Do they look more like trails than paths? Worn areas that have been trampled down from repeated use? If so, here is a sure fire way to convert those worn out trails into sturdy, long lasting garden walkways. (BPT) – Paths provide the practical purpose of connecting two or more locations but a well-made walkway that will stand up for years can enrich the natural landscape of a backyard and complement the exterior look of a home. While traditionally popular materials for creating paths, like brick and stone, are attractive and durable, they can be expensive and challenging to install. An easy and affordable alternative is to build a path yourself using a plastic form and pre-mixed packaged concrete. Taking this approach not only minimizes cost, time and headache, the preference and personal taste of each individual homeowner dictates the color, style and movement in the finished concrete path. It starts with selecting the style of path, which can range from a natural looking country stone pattern to a more standard running bond brick pattern. 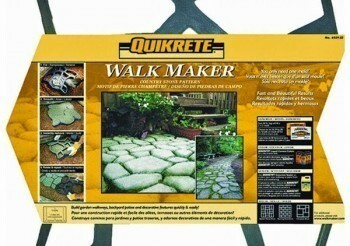 The QUIKRETE Walk Maker forms are 2 foot by 2 foot and conveniently hold one 80-pound bag of concrete, so homeowners can work on the path at their own pace by following these simple directions. * Remove the sod and soil to the desired width, shape and length of path, be sure to keep it as flat and level as possible. * Slowly mix the concrete and water in a wheelbarrow with a garden hoe, shovel or in a concrete mixer according to the directions on the bag. 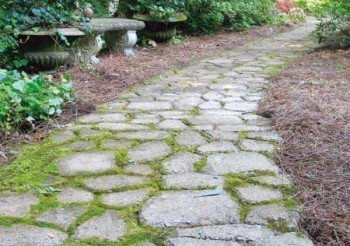 * Lay the form at the beginning of the path and fill with concrete mix, being sure to smooth the surface with a trowel. * Continue by placing the form against the completed section of the path. Then fill with the concrete mix, remove the form and smooth the surface. Repeat the process until the path is complete. * To create a curved walkway, after removing the form from the freshly poured section of path, reposition the form in the direction of the curve and press down to slice off the corner. Use a trowel to consolidate and smooth cut off edges. For more tips, direction and information on laying a concrete path using forms and pre-mixed packaged concrete, visit www.quikrete.com or look for QUIKRETE on Facebook. If you want to know what other folks have to say about this system, you can check out some of their reviews at Amazon. Have you any experience with this paver system? Would you care to share some tips with us?